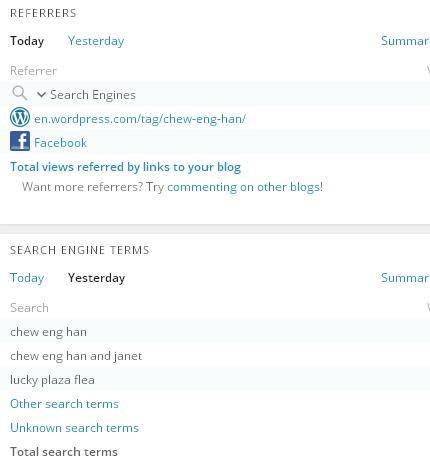 I believe the people who keeps coming into my blog for my ex Cell Group Leader Mr Chew Eng Han have been waiting for some juicy inside news and thus the crazy amount of browsing and etc. I am sorry but i have no juicy news for anyone here. I am disgusted by the amount of Kaypos googling on Eng Han at this time. I cant help feeling very very disgsuted. Last week, Eng Han announced his departure from City Harvest Church and has caused commotion and gotten many reactions from different people. Needless to say, many people blamed him for his decision and called him a traitor. Of course, there are people applauding his courage and encourage him to stand up and speak the truth. While the CHC or Pastor Kong haters were rooting for him as if he is some WP against the PAP. It seems political and while it isnt his intention to, media and immature people made situation seems bad. From Day 1, he has never for once asked me to leave Church, he has never ask anyone to leave CHC. There was no intention of sowing discord and all he told me was that he is still my friend and i can still contact him should i need any pastoral help. I am just a small fry in church, i am less than 5 yr old in Church, yet i have seen and went through the biggest drama of Singapore – in my very own Church. Is it tiring? yes it is, no doubt abt that. Afterall, isnt a Church a peaceful and drama-free place? Well, i feel it depends on how you see it. A person’s perspective and attitude towards every little thing matters more than his or her surroundings. I feel that my family and i really benefited from Church and its leaders, ministries and people. For Eng Han to make such a major decision, i cant be anymore sure that he has used sufficient time to consider all the consequences, pros and cons. For a spiritual man like him, prayers is a definite thing, at all time, during or even before the decision was announced. For those that judged him and called him traitor, i really really feel extremely offended and saddened. I understand the wrath one might have because of this decision, it doesnt help when it come at such a weird timing, just weeks before the 2nd half of the trial. I felt shocked and intimidated too ( initially). But lets calm down and respect his decision. We have been very judgmental for the longest time. One very very bad point about human race is that we judge all the time and we decide for people what kinda decision they should make. We like to manipulate and control others’ minds and make them make the decision we ourselves desire. It is his decision, why cant we be gracious about it and respect his decision and leave it as that? Are judgments really necessary? Frankly, it doesnt matter. Your views and judgments DOES NOT MATTER. We are believers arent we? The very basic of God’s teachings, have we forgotten all about it? Our views and judgments DOES NOT MATTER, what matters is God’s view. So you shouldnt be pointing fingers at Eng Han and calling him names because that is purely YOUR VIEW, God doesnt view him as a traitor. God doesnt label people that way. It definitely angered me that people are calling him names because Eng Han is my friend, i respect whatever he did, and whatever decision he makes because till date, he has not done any shameful thing in my opinion. Likewise, those that do not know what is going on really shouldnt start insulting the Church and the Pastors just because of Eng Han’s announcement. Again, leave it to GOD will ya? As the story unfolds, God is also unfolding TRUTH. We have waited for years, y not just be patient and wait on for the whole story? There are ALOT of things happening, ALOT of information, ALOT of unexpected details at this moment. I do not want to judge or take sides, i will not say anything because ntg is official and i am not a spokesperson for anyone. My knowledge is limited. If you are really concern, wait patiently, it is only weeks to the next trial, more will be revealed along the way. Anyway, a person who is really concerned will not slander anyone before anything is official. At this moment, i hope that the people who knows Eng Han personally can stand with him and his family, it is really really tough for them. He is prepared to be judged before announcing this decision but he doesnt deserve all the criticisms. Nobody deserves that. 1) Crossover mission, nobody says that Crossover is fake, it is genuine and we saved lives. Nothing is gona change that fact. 2) The Church is still doing good deeds and Pastors are still giving their best in their preachings. 3) Many were saved and City Harvest Church really helped alot of people and i am one of them. As for Eng Han, he has done his part for the Church the last 17 years and especially now. I truly feel for him and i pray nothing but Fairness and Justice for him. He is no longer my Cell Group leader but he is my Friend and Mentor forever. To all who read this space, lets all be patient and walk through this with prayers and discernment. However, i strongly believe that this is not an issue of taking sides nor staying/leaving CHC. If you are concern for the parties involved, pray for them. Wish them well. As for yourself and even myself, guess we have to discern which direction is spiritually beneficial for us, which direction is God’s path for us and will build our growth. Instead of being a kaypo, instead of asking what happen constantly and finger pointing, all we can do is to be still and Let God. Oh, i have alot of you texting me asking what happened, what church EH is going next, this and that. May i say, these are all redundant to know at this moment. So please dont ask me such qns anymore. Lets keep the Church and the 6 in prayers. Especially for the bbg group of friends, may God bless us with utmost favour this period.